Structural Deficit - What Does It Mean? What is a structural deficit? 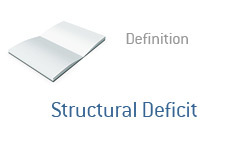 What is the definition of a structural deficit? What does the term "structural deficit" mean? A structural deficit occurs when a country (or state, municipality, etc) posts a deficit even when the economy is operating at its full potential. This is the opposite of a cyclical deficit in that a cyclical deficit only occurs when an economy is not performing to its full potential (for example, if an economy is currently struggling through a recession). In the case of a cyclical deficit, any borrowing that is needed during the low point of the economic cycle will be repaid when the economy turns higher and there is a cyclical surplus. On the other hand, a structural deficit means that a deficit will be posted regardless of how well the economy is functioning - recession, boom or anything in between. In a structural deficit, things are so out of balance that a country (or state, or municipality, etc.) will post a deficit regardless of how well the economy is doing. In a strong economy, revenues (tax receipts, etc) rise due to increased economic activity (more jobs, more spending, etc). With a structural deficit, the strength of the economy is irrelevant - a deficit will be posted regardless..
How do countries get rid of structural deficits? 2. Raise revenues (usually through tax increases). Neither of these options are too appealing for politicians, which is why many structural deficits continue to linger. Deficits lead to increased debt loads, which in turn lead to even higher deficits (due to the interest paid on debt outstanding). What Would The US Deficit Be if the Economy Wasn't In the Dumps?